left and right front forks to the same setting. Turn the spring pre-load adjuster (1) counterclockwise fully. From that position (softest), turn it clockwise to the specified position. Fully turn the rebound damping force adjuster (1) clockwise. From that position (stiffest), turn it out to standard setting position. 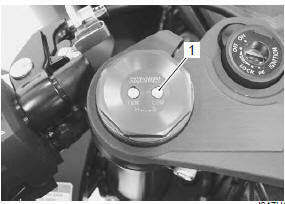 Fully turn the compression damping force adjuster (1) clockwise. From that position (stiffest), turn it out to standard setting position.